Lots of folks talking/writing about the pain cave lately. I loved a line in Kacie's (she's one of my new Trakkers Teammates) riveting 50k race report where she "redecorated" her pain cave. An awesome post from Joel (another new teammie!! ), about where the pain cave is located, got me thinking about my pain cave. 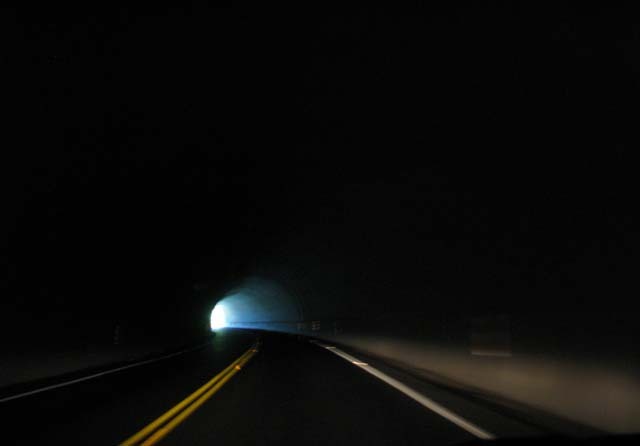 - tunnel vision; it's been known to get people to their goals. So bring on the Pain Tunnel, maybe I'll take Kacie's advice and decorate it, get comfy in there. I love it. I mostly love the idea of there being an END to it. I was just hanging out in mine during the race Saturday, but I really like the idea of moving through the space rather than just getting stuck in it! Thanks for the mental image! I know I will use it! I love all the thoughts of the pain caves/tunnels lately! :) I'll have to define this for me too! My "cave" is pretty bright and it is the only way I get caught up on TV. ha I only watch TV on the trainer really. For the most part I TVio stuff I like and watch it when I go to the cave. I like the mental imagery! Love it. I've never liked the term, pain cave. A friend of mine named our relay team Pain Cave MANY years ago and I didn't like it then either. Hurt locker is even worse. Just don't make it TOO comfortable. That would totally defeat the purpose. "Pain cave" might aptly describe running, but the light at the end is your salvation and your goal, which ultimately leads to your happiness in enduring the race.